ProFire Grills are made in the U.S.A. and their beauty goes far beyond appearance. Each ProFire grill is precision engineered and constructed of quality materials. The result is a wide selection of grills that offer long term durability and a lifetime of reliable use. 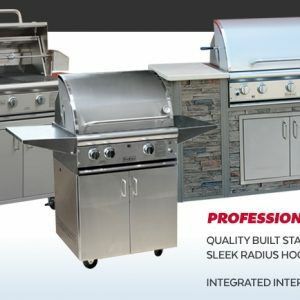 ProFire, a divison of MHP, has a range of portable and built-in outdoor grill options to suit a variety of outdoor cooking needs and backyard designs.